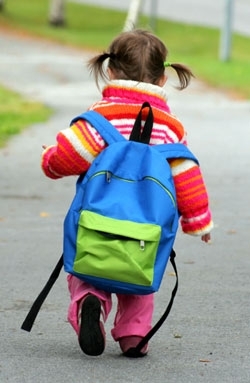 Are Kid’s Backpacks Too Heavy? I think the easy answer here is YES! You should go weigh your kid’s backpack. The experts say it shouldn’t weigh more than 10-15% of their weight. So, if my kid weighs 80 lbs, they can only carry 8-12 lbs of books. With the average textbook weighing 3-4 lbs, that’s not much. So, what do you do? I’d like to say that you don’t bring all you books back and forth and put everything online, but I don’t think that’s going to happen anytime soon. A logical answer is that you give the kids bags with wheels that they pull around. That seems easy enough.